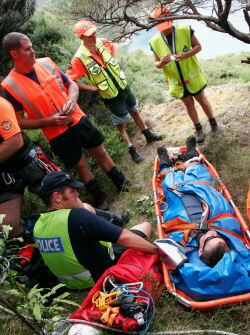 In New Zealand, Land Search and Rescue services are mainly provided by volunteers. Currently, our specialised cliff-face & cave rescue teams gear is 98% personally owned. As both of these activities are high wearing, this places an additional burden on our specialised team members. country. Because of the voluntary nature of our organisation, help in the form of bequests, donations or sponsorship is greatly appreciated. You can also make a donation by making a direct bank deposit to ASB 12-3099-0427787-00. You can also make a bequest to Northland Search and Rescue in your will. This may be arranged with your lawyer or duly appointed agent. Northland SAR is also open to sponsorship. Our budgets for training and equipment are constrained by our limited resources. In particular, our current Cliff and Cave Rescue equipment upgrade programme will mean a considerable outlay in hardware. Any assistance in this area would be greatly appreciated. NLSAR are open to negotiation for company logo/s on the side of our SAR caravan, and publication within our newsletter. Please send us a email at letting us know if you make a donation through Direct Bank Transfer so we may acknowledge your donation.